Telegram continues to build on the success of its mobile apps, offering everyone additional quality of life improvements more often than not. The v5.2 update is no different, bringing options like group permissions, a chance to undo accidental chat deletions, and a few others. 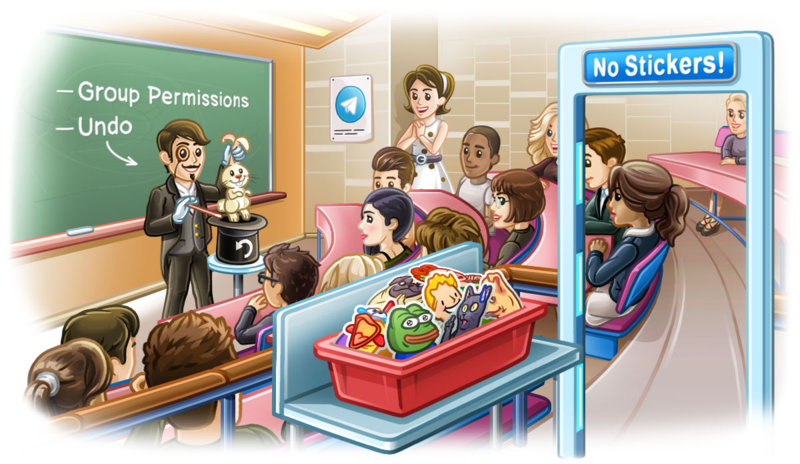 Global permissions for groups: Restrict all members in any group from posting certain types of content. Unified group settings: Make groups public, set admins with granular permissions and toggle persistent history in any group. Undo deleting chats and clearing chat history within 5 seconds, detailed confirmation dialogs when deleting chats. New sorting options in Contacts: by name or by last seen time. New animations when uploading and downloading media. Groups are a big deal on Telegram, and even though I personally don't have any interest in using them, I can see the appeal for certain people. Most of these updates focus on making admins' lives easier, and continuing with that, 5.2 now has the option to set global permissions for that group. On a similar note, Telegram has doubled the member limit of supergroups to a mind-boggling 200,000. Oh, and supergroups and basic groups are all just "groups" now — how many times do you think I can say that word in a sentence? That means everyone has access to granular admin privileges, public setting, and the persistent history toggle. Moving on, all users can appreciate the new option to undo an accidental chat deletion or history clear. The app will now give you a five second Ctrl+Z, allowing you to yell your expletive of choice and bring back what you just accidentally deleted. Nifty. Wrapping this up, you can now sort your contacts based on name or when they were last seen. For some, that might be great, but I can never have a contacts list in any order that isn't alphabetical. You'll also see some new animations when you're uploading and downloading media. It's a subtle change, but I like it. Telegram v5.2 is rolling out in the Play Store, but you can also grab it from APK Mirror if you'd rather.